BRAINTREE, Mass. 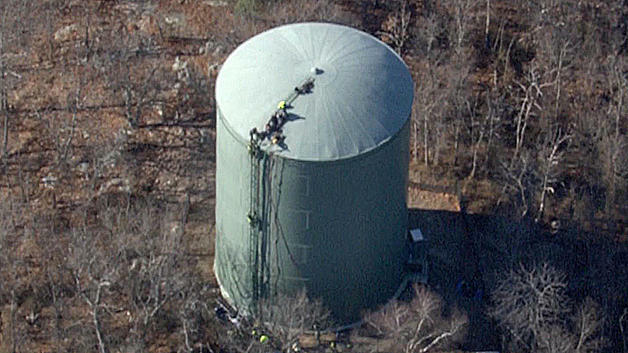 -- The body of a diver who died while doing an inspection on a million-gallon municipal tank in Massachusetts has been recovered. It took 16 hours to drain the tank so crews could recover the man’s body. His body was removed early Friday morning. Officials said on Thursday that an equipment failure may have been to blame during the routine, five-year maintenance inspection. The man radioed to a spotter that he was losing air shortly before he lost video and radio communications. The spotter jumped in to help, but the man slipped away and the spotter then had to be pulled out and taken to a hospital. Officials have said there was no threat to the town’s water supply. The man who died, who has not been identified, was from Texas, CBS Boston station WBZ-TV reports. His 14-year-old son was on the ground at the scene when the tragedy unfolded, the station reported.